Day of the Dead is a holiday not only celebrated in Mexico, but in parts of Central and South America and even in some parts of the Caribbean. Festivities occur over two main days, the 1st and 2nd of November, where families flock to grave yards/cemeteries elaborately decorating the graves of loved ones with candles, the cempasúchitl flowers and the favourite foods and beverages of the deceased. Quite far from the cold grey cemeteries of Europe; here in Mexico they are bustling with music, dance, and a sense of warmth. There is something exciting about celebrating the dead. There aren’t masses of people with sad faces, crying, with fists in the air screaming “why God whyyyy”, and no lonely mossy graves with the odd lily or rose. Instead, there are explosions of burnt orange, jokes, food, and people telling their favourite stories about their deceased mothers, brothers, and grandmas. Remember that time when he sat in that deck chair and it couldn’t take his weight and it collapsed and he was stuck there for an hour?! Everyone erupts with laughter. Fireworks explode. Glasses are raised. Everyone cheers and takes a swig. I imagined what would happen if we were to have this tradition in England and then I imagined the grave of my granddad; it would be fashionably decorated with a pint of John Smiths, Walkers Ready Salted crisps and my grandma′s famously delicious Sunday roast. I then thought about my own grave and decided that my children would have to buy shares in the Peking Duck takeaway on Smithdown Road to suitably adorn my grave with wontons and hoisin sauce. At first glance this holiday seems morbid and somewhat odd but perhaps this is what draws us to the candle-lit shrines, the smell of incense and the garishly decorated skulls. Long live the dead! 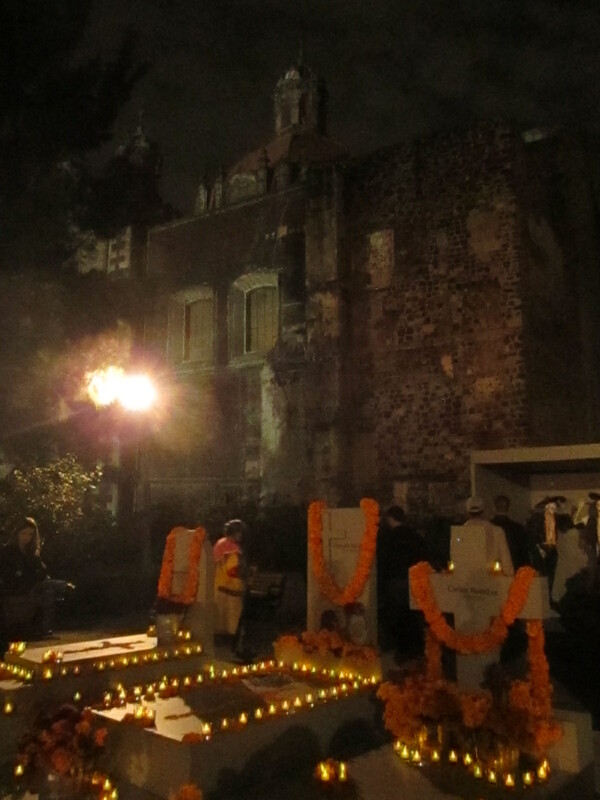 Day of The Dead shrines outside of the Museo de Memoria y Tolerancia, Mexico City. 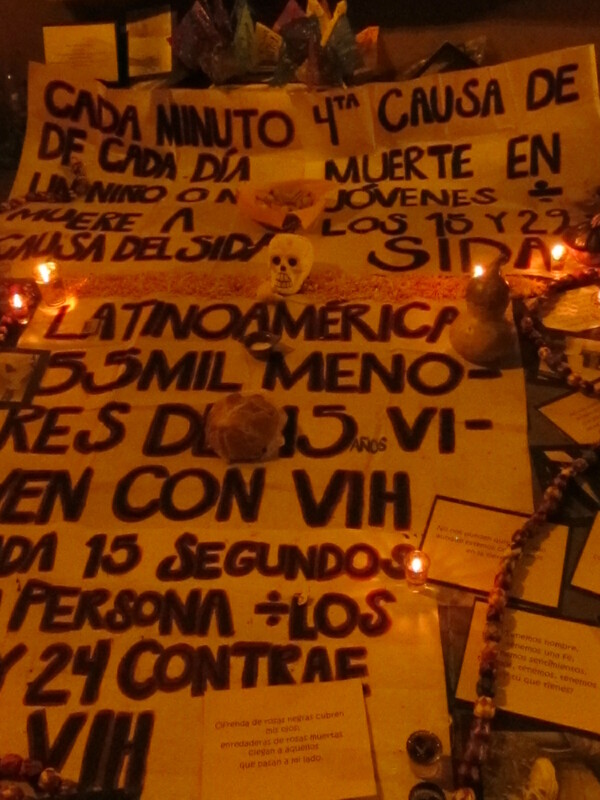 A shrine dedicated to those who have lost their lives to HIV and AIDS, Museo de Memoria y Tolerancia. 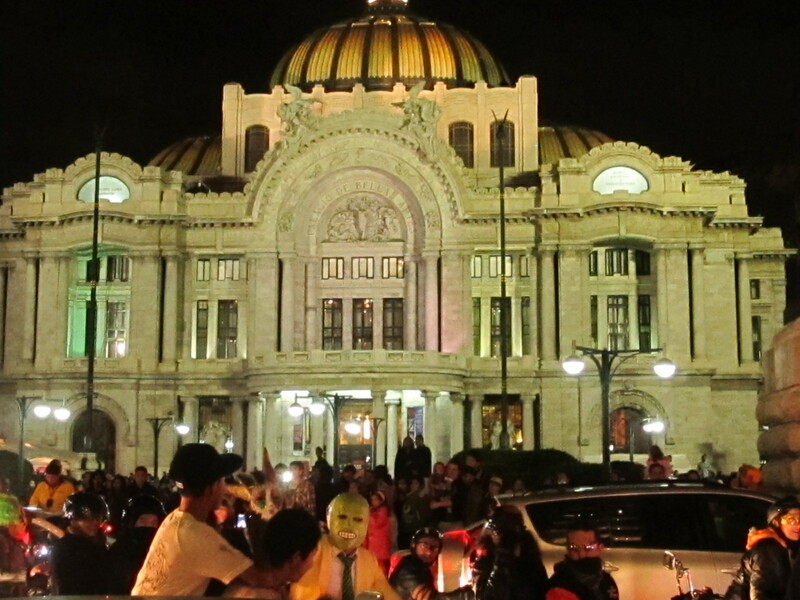 A clan of over 70 motorcyclists in various costumes and disguises wait in traffic in front of the majestic Palacio de Bellas Artes, Mexico City. 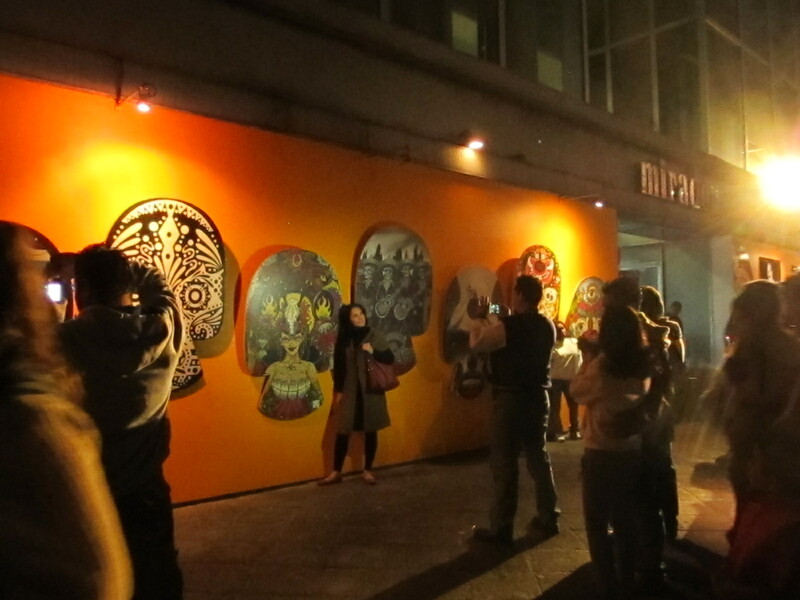 Foreigners and Mexicans alike take pictures in front of the colourful skulls associated with the holiday at an outdoor exhibition at the foot of the Torre Latinoamerica, Mexico City. Remembering the dead: replica graves of famous Mexican nationals such as literary legend Carlos Fuentes are erected and adorned with candles and the cempasúchitl flower (a type of marigold here used for Day of the Dead festivities). 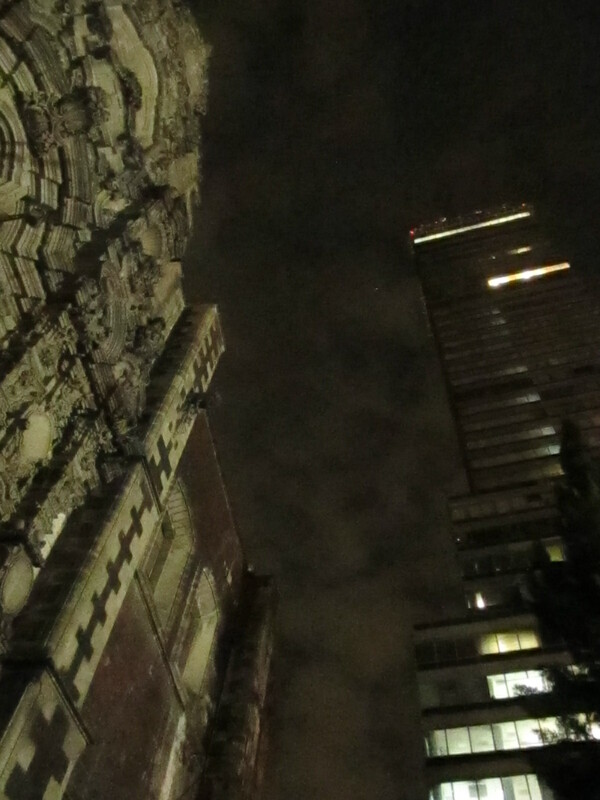 A clash of the old and the new: The Torre Latinoamerica shadows over the Church of San Francisco, Calle Madero, Mexico City. 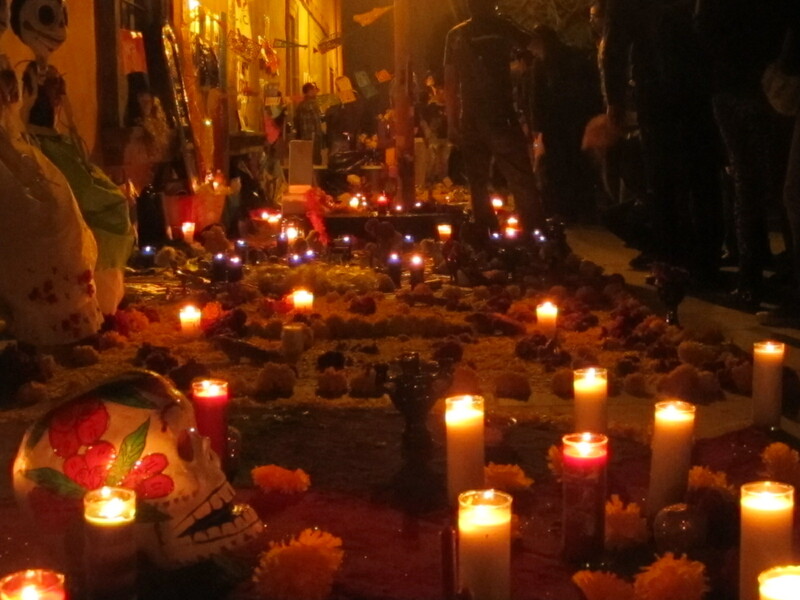 Both pre-Hispanic and Christian traditions are combined when celebrating Day of the Dead. 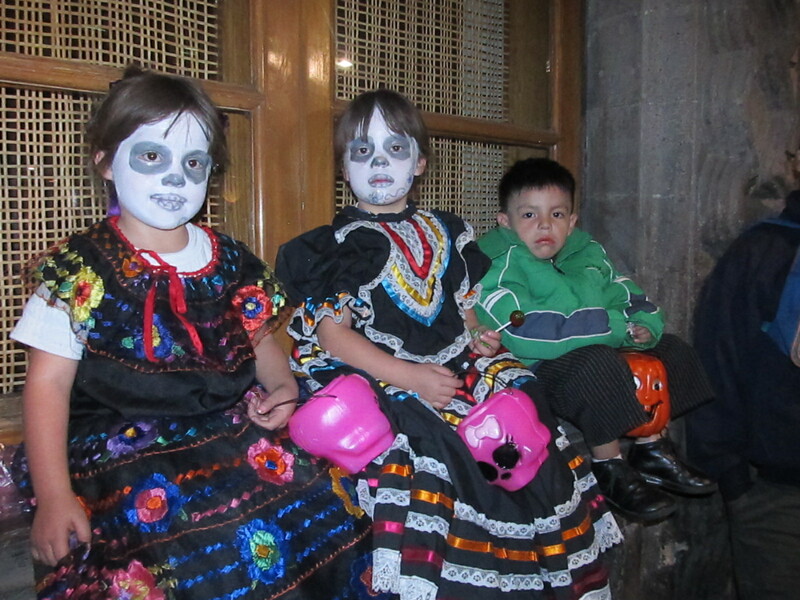 Two children dressed as the famous La Catrina figure, inspired by the famous Mexican painter and cartoonist Jose Guadalupe Posada . 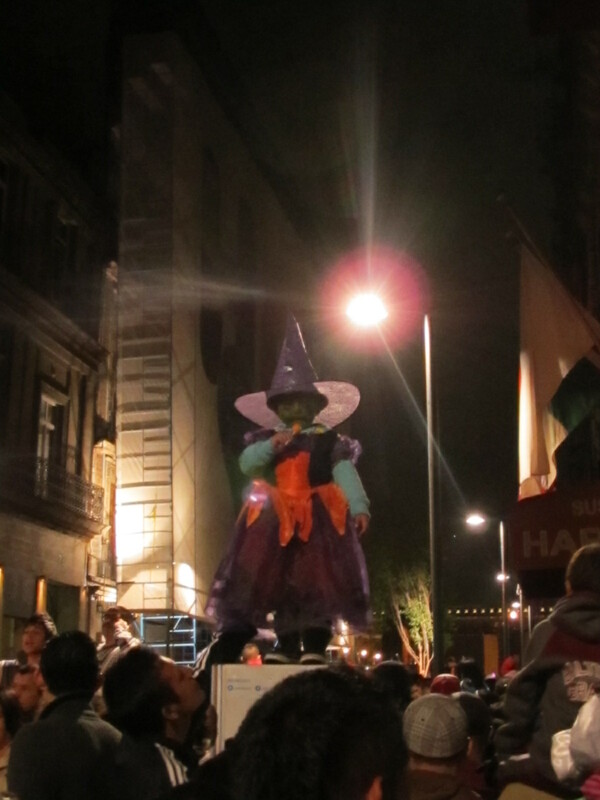 A little witch stands with her trick or treat lollipop stash on the top of a telephone box and observes crowds in their thousands walking down Calle Madero towards the Zocalo, Mexico City’s main square. 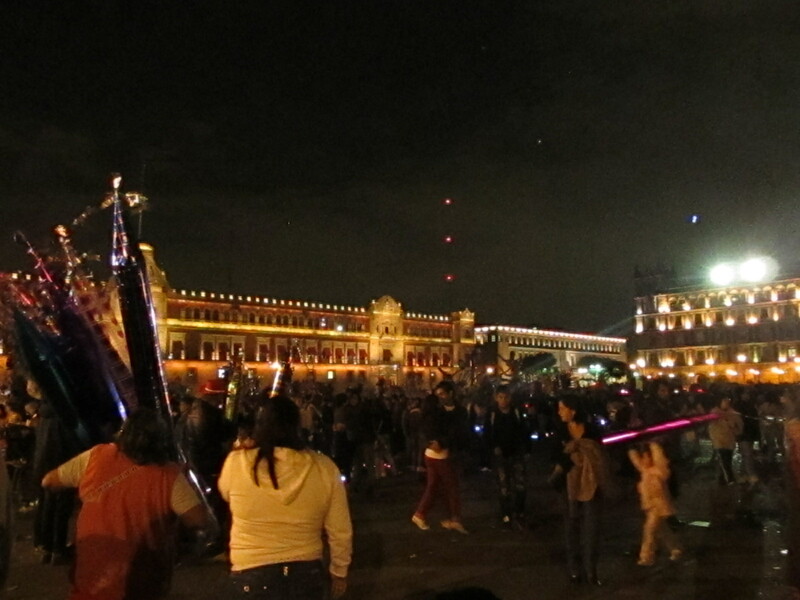 Crowds gather in the main Zocalo in Mexico City: street vendors sell enormous inflatables whilst people dance and enjoy the festivities. Love your thoughts and photos here. It’s such a (refreshing) contrast to Europe and the UK isn’t it!